Measures 15 by 7 1/2"
Yabba-dabba-doo! Unless you’re Jon Hamm, (seriously, has anyone noticed he looks just like Fred Flintstone, if Fred Flintstone were arrestingly suave?) 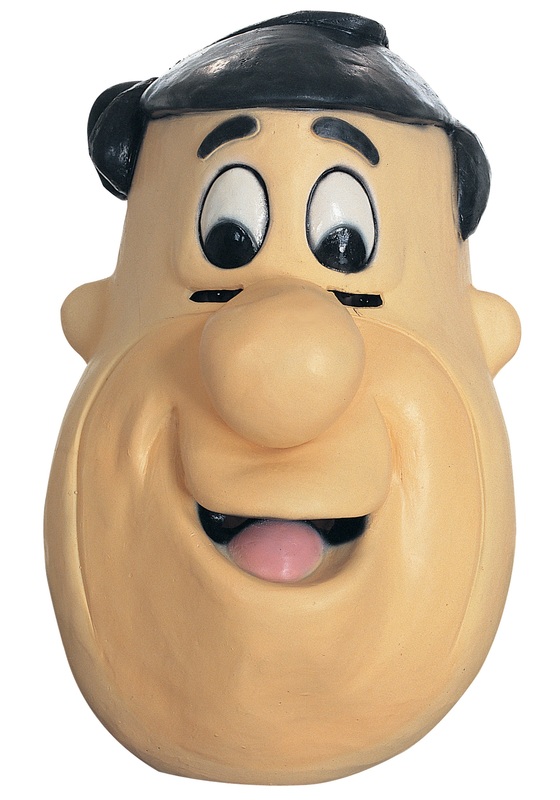 anyone serious about dressing up like the Bedrock patriarch is gonna need a good mask to go along with their leopard-skin jacket, some dinosaur spare ribs, and a car with a hole at the bottom for you to move with your feet. Otherwise you’ll just look like any old caveman schmuck. It’s officially licensed, of course––you think we screw around with Big Cartoon?––and looks like Fred for a funny and authentic addition to any costume. He might be best know these days as the face of vitamins to a generation of kids, but before drugstore dominance and a couple of best-forgotten live-action outings, good ol’ Fred Flintstone was one of the most beloved cartoon characters of all time. He’s known for being less than kind to his wife Wilma, best-buddy Barney Rubble and dog, err, dinosaur Dino, but Fred’s a real softie when it comes to his daughter Pebbles. Patterned after Jackie Gleason’s Ralph Kramden from The Honeymooners to the very edge of legal actionability, Fred Flintstone is part of a classic lineage of oafish sitcom dads, having himself provided the blueprint for Homer Simpson, Peter Griffin and many more. Just like all of them, we all know Fred’s a good guy at heart… kinda, sort of. Hey, he tries! Settle into Bedrock and get your best Yabba-dabba-do on. Don your hardhat when you clock in at the quarry, and do your best twinkle-toes when heading down the land at the bowling alley.